CHARLESTON, West Virginia, February 16, 2015 (ENS) – Balls of fire blasted into the sky and at least one railcar landed in the Kanawha River this afternoon as a CSX freight train carrying oil derailed near the town of Mount Carbon, in south-central West Virginia. With two locomotives and 109 rail cars, the train was carrying crude oil from North Dakota’s Bakken formation to a storage terminal in Yorktown, Virginia when it ran off the rails. Twenty-five cars of the 109-car CSX train derailed in the community of Adena Village near Mount Carbon, said Theresa White, director of Fayette County Emergency Management. 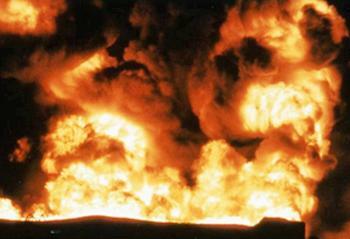 At least 14 tank cars were reported to be burning following the derailment, and some cars exploded. There was burning oil on the water, and a section of State Route 61 was burning, Kanawha County Manager Jennifer Sayre told the “Charleston Gazette” newspaper from the Kanawha County emergency operations center. CSX said one person was being treated for possible respiratory problems, but no other injuries were reported. The derailment caused the precautionary evacuation of nearby communities. One house caught fire, but responders are having trouble reaching that home because of the derailment. No fatalities have been reported. Oil from the railcars in the river may have contaminated the drinking water of surrounding communities, and operations at the Cedar Grove and Montgomery water treatment plants have been suspended as a precaution. People served by those systems are urged to conserve water. Governor Earl Ray Tomblin declared a state of emergency for Kanawha and Fayette counties because of the incident. CSX has established a community outreach center to address community needs as a result of the train derailment at the Glen Ferris Inn, US Route 60, Glen Ferris, West Virginia. CSX is working with the Red Cross and other relief organizations to meet the needs of residents in the small town of Mount Carbon, population 428. These efforts include shelters for residents who have been evacuated. The U.S. Department of Transportation late Monday night announced that Federal Railroad Administration Acting Administrator Sarah Feinberg and the agency’s chief safety officer, Robert Lauby, would travel to West Virginia to view the scene. The area is under a winter storm warning as it is part of a corridor stretching from New England to the Deep South where problems from the weekend’s blizzard begin mixing with the latest winter storm moving east. Crews are working as heavy snow descends upon the region. The snow will taper off late tonight, but the respite will be short-lived, according to the National Weather Service. Snow returns to the forecast Tuesday night and Wednesday as another Arctic front produces snow squalls and opens the doors for another surge of frigid air Wednesday night and Thursday. This derailment and fire occurred less than 48 hours after a CN freight train carrying oil derailed and caught fire in a remote area of Ontario. Today’s derailment occurred on the same CSX freight line as a April 30, 2014, crude oil train derailment in Lynchburg, Virginia where 13 cars ran off the rails. Three of those cars sank into the James River. That train was also traveling from North Dakota to Yorktown, Virginia. The U.S. Department of Transportation last week sent new rules governing oil train safety to the White House for review, before they are released to the public. 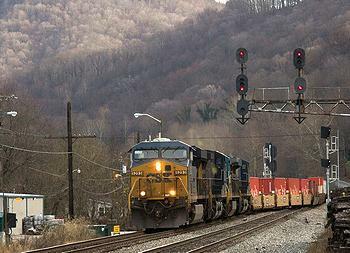 The railroad industry is already lobbying Congress to approve no new rules at this time. Reacting to proposals floated by some shippers both on Capitol Hill and before the Surface Transportation Board that would cap railroad earnings and hamper future ability to make service and safety investments, said the recovering U.S. economy cannot afford to lose rail’s annual private investments. The freight railroads’ massive private spending, estimated to be a record-setting $29 billion in 2015, is key to keeping economic recovery on track and enhancing the country’s global competitiveness, Hamberger said. Since the rail industry was partially deregulated in 1980, it has spent some $575 billion, or roughly $79 million a day, enhancing and upgrading the country’s rail network, he said.